Hello. I'm Rory Chasen, and my stories are featured in the Superstition Mystery Series which began this year with Lost Under A Ladder. I described some Thanksgiving superstitions when I was here last month. Today I'll be talking just a little about Christmas superstitions since I'm hoping to bring you luck--even though I'm still skeptical about luck and superstitions despite living in Destiny, California, which is all about superstitions. I know today is the first full day of Hanukkah but I'm not aware of any good luck Hanukkah superstitions. If you happen to know of any, please let me know. Why do I want to bring you luck? Well, I've been told that each of us who blogs on Killer Characters during this month will be giving away something on our blogging day. That means someone who leaves a comment here today will receive a copy of Lost Under A Ladder, plus a little lucky swag. So what can you do to bring yourself some luck today? - It's good luck to hang mistletoe. Also to kiss under it. - Make a Christmas pudding today and stir it. It's also good luck to find a charm in it. - Although it's a bit early, if you happen to have carolers visit your home today, give them some gifts. Or, you can of course resort to the standard kinds of superstitions. Cross your fingers when you leave a comment here, although that can make it a little difficult to type. Knock on wood that you'll be the winner. Will any of this actually bring you luck and ensure you'll receive today's prize? I can't promise it will to all of you, but it certainly should to one of you! I'll keep my fingers crossed that it's you. Be sure to leave a comment today for a chance to win a copy of Lost Under A Ladder and more! Fingers crossed. I consider myself lucky every year when I make it though the Holidays. I will wish everyone luck! Happy Holidays! Knock on wood! Sounds like a great new series. Merry Christmas/Happy Holidays. My grandmother was very superstitious - throw salt over your shoulder, don't seat 13 at the table . . . I didn't think I picked any of that up until I realized I always knock on wood! Just in case, you know. Do people still go caroling? I remember doing that as a kid, but I can't recall the last time any carolers came to the door. We used to have our Girl Scouts go caroling at the senior citizen's homes. I'm crossing my fingers and knocking on wood! Not really, how could I type then? I love superstitions, so I'm crossing my fingers (and my toes), knocking on wood, not walking under any ladders, not letting a black cat cross my path...etc! Sounds like this is a going to be a great read! Thanks for the giveaway! I love mysteries with pets; but I'm not superstitious!! Thanks for the chance to win! I'm fully of superstitions---maybe I can learn a few more from the book. Thanks for the contest. Fingers crossed that I win. 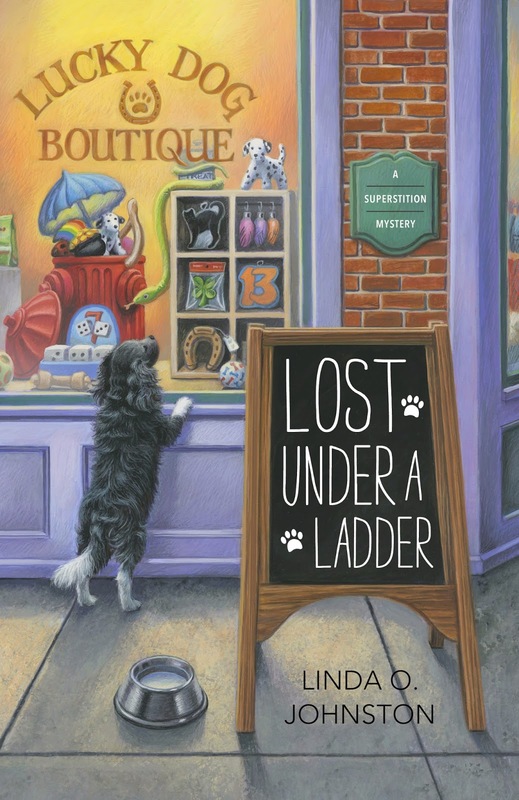 Lost Under The Ladder sounds like a great book, and the cover is adorable. If it will help, here's to knocking on wood! Thank you for the contest and wishing everyone a wonderful time over the holidays and next year. Sounds like an interesting new series I'd love to explore. Hope for luck of the Irish to be a reader reviewer of series new on the scene. Thank you for opportunity. I'm not particularly superstitious but I am a ravenous reader, so I thank you kindly for this lovely book giveaway! Sounds like a book that would be hard to put down, when I got started reading. I have some of your Kendra petsitting mysteries. I have cats. When I worked as a paramedic we learned never to say that the shift was "quiet". I agree with Kaye Killgore ( above comment) but mine was as a nurse in a hospital. You never said it was a quiet shift. I remember caroling when I was young and lived in the east. In California it's not cold and no one goes caroling. Or maybe that's just a thing of the past anyway. Superstitious? Who me? (Fingers crossed).. Sounds like great series start. Maybe I'll get kicky and win this! The only superstition that I really pay attention to is "it is bad luck to walk around with only one shoe on". Love books with animals and a mystery. My fingers are crossed!! sounds like this is going to be another great series. I don't think I'm superstitious at all. But there are things I do, just 'cause. "Knock on Wood" is one I'm always saying - not even sure what it's supposed to guard against. I'm superstitious somewhat. It never hurts to err on the side of caution. Have read your books since -- well, forever. Love books that involve rescue animals and the adventures of being a pet sitter. Meowy Christmas to you. Thanks for the wonderful reads. I hadn't heard some of those tips for good luck. Thanks for sharing.